While media reports have shed considerable doubt on Apple's capacity to facilitate a full-scale launch of its second-generation iPad in the short term, AppleInsider has reason to believe that customers could be holding the new tablet device in their hands shortly after next Wednesday's press event. According to people familiar with the matter, Apple is preparing several of its operating segments to perform functions during the second half of next week that are representative of nothing short of a large scale, consumer-oriented product roll out (not just an announcement). And with official invitations to next Wednesday's press briefing clearly indicating a focus on iPad, these people believe at least one version of the refreshed device will be in transit to retail outlets during that briefing. It should be noted that while nothing is definitive till Apple issues a statement, these same people have consistently provided accurate information regarding Apple's future product plans and the timing related to those plans. At the same time, their predictions arrive in stark contrast to a variety of reports over the past few weeks that have insinuated Apple would for some reason choose preview a new iPad at the top of the month but be unable to ship it till the end of the month, the following month or sometime thereafter. In less than a year, the iPad has rapidly grown from what was once thought to be a niche product into an asset that's on the verge of generating 20% of Apple's business on a quarter-to-quarter basis. Of the $26.74 billion in revenue the Cupertino-based company reported for its first fiscal quarter of 2011, $4.61 billion was attributed to the iPad, of which $4.4 billion was from the sale of the device itself. Therefore, teasing new iPads that wouldn't ship for 4 weeks or more would undoubtedly bring sales of existing models to a halt and possibly cost the company billions. It should also be noted that the logistics of the WiFi iPad are similar to that of an iPod, rather than an iPhone or 3G iPad. Those two products have, and are likely to continue to be pre-announced, as Apple requires the cooperation of its carrier partners to usher those devices to market; partners that it doesn't trust to keep a tight lid on proprietary information and are therefore sometimes made aware of the company's precise plans in-line with the general public. To the contrary, the roll-out of a WiFi-only device is contingent on only Apple itself. 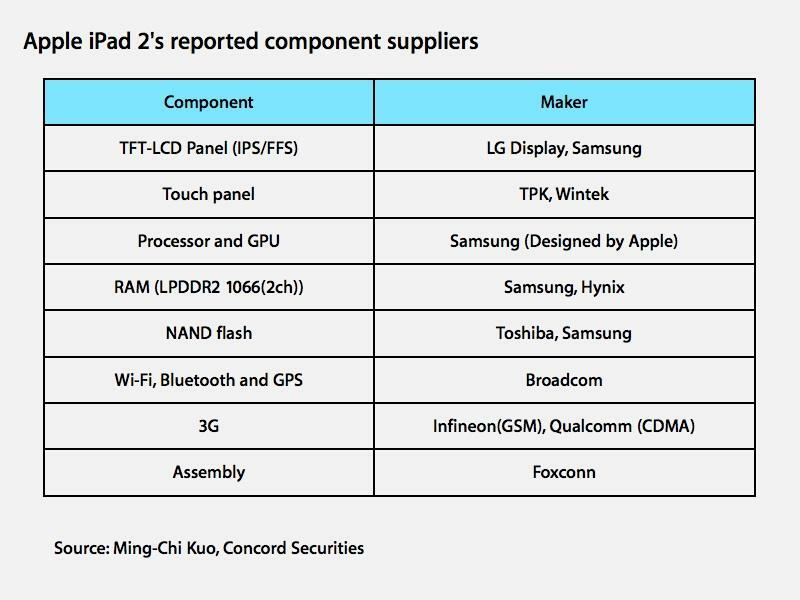 As it stands, Apple is expected to introduce the second-generation iPad in three variants and several different capacities. 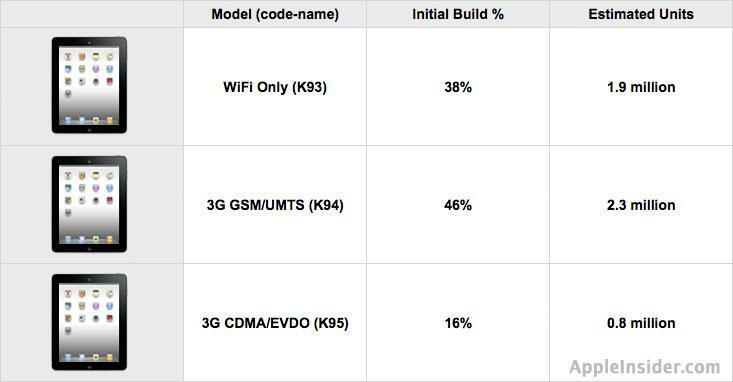 In addition to WiFi and GSM-based models targeted at AT&T and a broad range of European 3G providers, a CDMA version catering to Verizon and some Far Eastern providers is also reportedly in the cards. These models are reportedly code-named K93, K94, and K5, and carry initial build volumes of 1.9 million, 2.3 million and 0.8 million, respectively. Aesthetically, the second-gen iPads are said to be somewhat slimmer and lighter, sporting a redesigned speaker grill and re-located SIM slot. They're also expected to feature 30-35% thinner display panels from LG and Samsung with "anti-reflection" technology to deliver a better experience in bright sunlight. As AppleInsider reported last month, they aren't expected to include SD Card slots or Retina-quality displays, the latter of which is now targeted at a successive revision to the tablet. 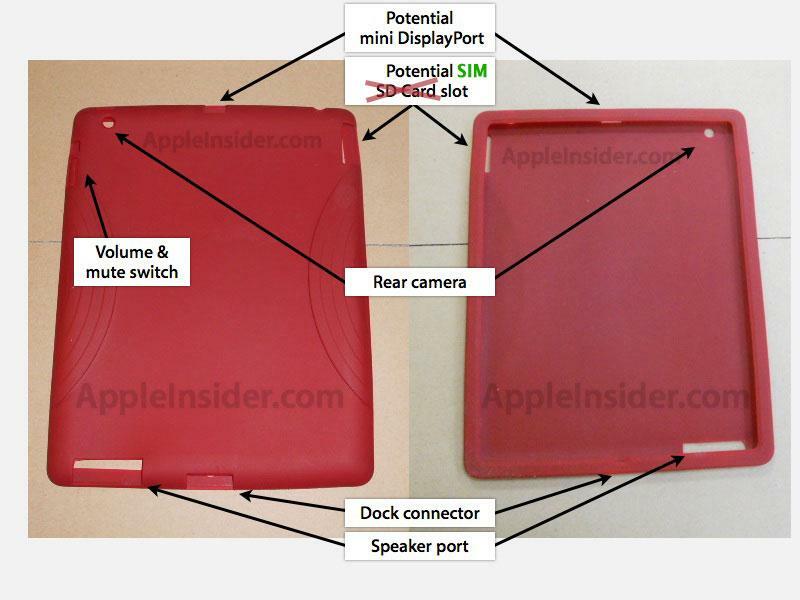 Under the hood, the new iPads are believed to employ a so-called Apple A5 chip based around a Cortex-A9 dual core processor. This chip is said to deliver a better balance between computing power and power consumption than existing models. Similarly, the new models are also expected to pack ultrafast, dual core SGX543 graphics on the order of two to three times faster than the chip in the current iPad, a faster memory (1,066 MHz) clock, and a doubling of on-board RAM to 512MB.